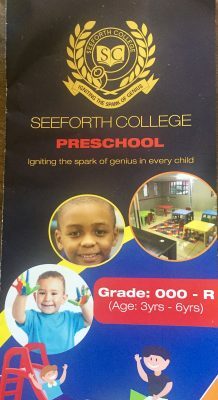 Seeforth College Preschool in Lynnwood Glen, Pretoria is an English medium preschool that offers an innovative, stimulating learning environment for 3 to 6 year olds. Children learn through play and free thinking, and imaginative exploration is encouraged. We are situated in Lynnwood Glen (close to Menlyn Mall) in the East of Pretoria. Wonderfully qualified and dedicated teachers, spacious class rooms and eco friendly playgrounds. Please visit our Facebook page too!